According to a new market report published by Transparency Market Research titled Household Cooking Appliances Market - Global Industry Analysis, Size, Share, Growth, Trends, and Forecast 2016–2026, the global household cooking appliances market is expected to reach a value of US$ 110.58 Bn by 2026. In terms of value, the market is estimated to expand at a CAGR of 6.1% during the forecast period from 2018 to 2026. 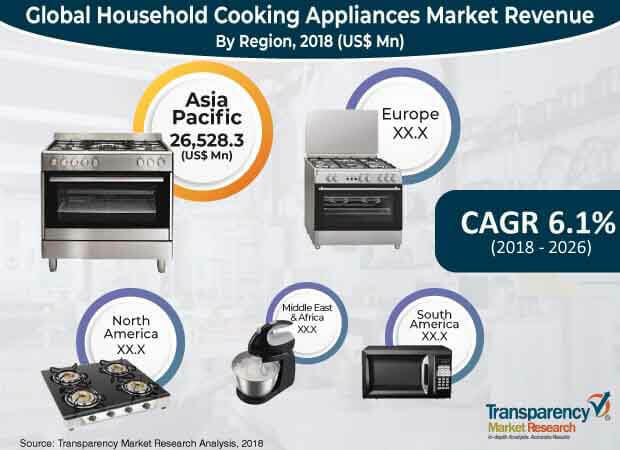 Increasing number of working women, and rising purchasing power and disposable income of consumers is expected to drive the market growth of household cooking appliances over the forecast period. Increasing preferences of consumers for energy-efficient alternatives rather than gas and electric devices and rising technological development of smart equipment for cooking food is also projected to boost the market growth in the coming years. Rising living standards have influenced consumers to opt for better designed and smart appliances in their kitchen which further positively influences the demand for household cooking appliances. Increasing trend of nuclear families and stability in terms of finance encourages consumers to invest in cooking appliances with enhanced technology, thus increasing their demand. Cooktops and cooking ranges segment is expected to hold the largest market share in terms of revenue and is also projected to grow steadily over the forecast period. This is due to introduction of smart equipment or IoT enabled equipment across the range which can be directly controlled by smartphones. In cooktops & cooking ranges, gas cooktops are anticipated to witness enormous growth in coming years due to their ability of regulating temperature instantly. The preference of consumers for energy efficient technology to cook food is expected to influence the increased demand for induction cooktops over the forecast period. Furthermore, increasing awareness about the benefits of induction cooktops such as easy installation and handling, minimal risk, effective management of heat, simplified cleaning process, and cost efficiency are expected to spur the demand for household cooking appliances over the forecast period. Demand for ovens is also expected to increase in the near future due to the availability of a variety of ovens with high capacity. Ovens are projected to witness a moderate growth rate during the forecast period due to the presence of innovative products equipped with easy control panels and auto program to enhance their usability and to meet the consumer demand. In the foreseeable years, manufacturers of microwave ovens in different parts of the world are likely to boost their use by addressing the changing requirements of food processing and the food service industry. Furthermore, specialized appliances such as toasters, mixers, food processors, and blenders are also considered as essential appliances. Almost all consumers own these special appliances for their daily chores in the kitchen. Therefore, the volume share of specialized appliances is more compared to the volume of ovens. The household cooking appliances market in Asia Pacific is expected to witness the highest growth over the forecast period due to the changing lifestyle, higher disposable income, coupled with greater affordability which has increased the demand for household cooking appliances in the region. The market in the region is expected to witness growth at a CAGR of 6.9% in terms of revenue during the forecast period. In Asia Pacific, cooktops & cooking ranges are expected to have substantial growth over the forecast period. The growth is attributed to the major adoption of gas cooktops across the urban as well as rural sector. The region comprises more of middle class consumers; therefore, gas cooktops are expected to have high demand during the forecast period. Among the countries of Asia Pacific, China is anticipated to dominate the household cooking appliance market over the forecast period. As the electronics industry has been a pillar of success in China, the country is known for producing electronics and smart devices at a massive scale. Low labor cost and a sizeable customer base gives China a high attractiveness index. .
Countries such as India and Japan are projected to have a considerable growth rate during the forecast period due to the growing number of households and their attraction toward household cooking appliances. The consumer durables industry in India and Japan has witnessed considerable change in the past couple of years. Some of the major players in the global household cooking appliances market are Electrolux AB, Haier Group Corporation, Hitachi, Ltd., Koninklijke Philips N.V., LG Electronics Inc., Midea Group, Miele & Cie. KG, Robert Bosch GmbH, Samsung Group, and The Whirlpool Corporation. The household cooking appliances market is segmented as follows:.